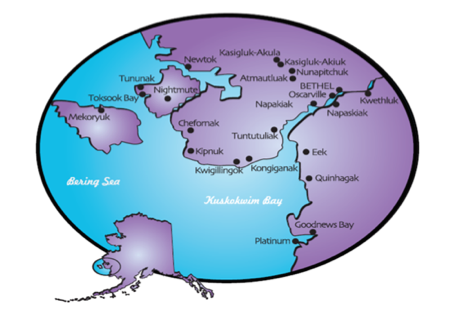 The Lower Kuskokwim School District was officially established in 1976. We are Alaska’s largest rural school district in the number of schools, students and staff. Located approximately 400 air miles west of Anchorage, the district encompasses the lower part of the Kuskokwim River Delta, along the coast of the Bering Sea. It is Alaska’s second largest rural school district in terms of geographical area with roughly 22,000 square miles of roadless tundra, and area equivalent in size to the state of West Virginia. Headquartered on the main campus in Bethel, the district office provides coordination of services and support to 22 village and 6 Bethel schools.